When I was enjoying my daily perambulations one day last week, I caught the attention of some of my neighbours. These particular neighbours tend to be interested in whatever is going on in our garden and they meandered over to see what I was up to. I had a brief chat with them then scooted off to fetch my camera, thereby learning an important writing lesson. Having captured our readers’ attention, it is tremendously important to hold it for long enough that they will want to hang on in and see what happens. I had not done that with my neighbours and when I returned with my camera, they had lost interest and wandered off to seek diversion elsewhere. So, when they returned the next day, I was prepared. I had my camera at the ready, having not only caught their attention but having also found a way to hold their interest. Writers know that you, the reader, have to be persuaded to read our book, so we try to come up with that captivating first sentence, that intriguing first paragraph, that riveting first chapter, but it can’t end there. As soon as we get boring, you get bored. So every chapter has to hold your attention. Ideally, we want you not to be able to put our book down until you’ve finished reading the whole thing, staying up all night if that’s what it takes. Sorry, I know that’s pretty mean of us to cause you to lose your beauty sleep, but just think of the rewards. You can have our story buzzing about in your head for days afterwards. You might well feel you’ve made some great new friends of our characters. My granddaughters made friends with my neighbours. They even got to know them better than I do, exchanging names and contact details. Daisy is just off to the left there, and she likes to be whistled over. Primrose prefers a soft mooing sound. Another lesson learned. It is important to connect with you, dear reader. I want to know who you are, what you like about my writing, what interests you, where I can find you, how I can reach you. So why don’t you pop your head over the hedge and chat to me – or simply add a comment in the comment box below. I love when you do. Well, here in Scotland, ‘the nights are drawing in’ and we’re beginning to look out warm coats and winter boots. Though so far November has been a beautiful month, autumn is fast heading for winter and it’s time to invite friends to join me round the fire. I have a dear friend, Lesley Richards, joining me for tea and cake today. Cake she made, of course, and kindly brought with her. But more of that later. I hope you enjoy meeting her. Lesley Richards is a well travelled Scot who combines an eclectic range of skills and passions including scuba diving, photography, painting and baking. After university in Glasgow and corporate jobs in London she now enjoys life based in Edinburgh where she combines corporate projects with creative pursuits offering artworks and images in various forms under the banner of Siren Art and bakes to order as Siren Bakes. First of all, Lesley, can you explain the unusual company names you have? I was nicknamed a mermaid when I first went scuba diving because my very long hair would come loose underwater. That became the ‘sea siren’, another term for mermaid. When I needed a name for my photography Facebook page, ‘Siren Art‘ seemed to fit, then when I set up a page for my baking it was only natural to continue the theme with ‘Siren Bakes‘. I know you love to travel, but where do you call home? We moved around the UK a lot when I was growing up, so it meant I got used to being in different places, so home is wherever I happen to be. I suppose I feel like I have lots of places I can call home as they feel familiar if I ever go back. I live in Edinburgh at the moment and must admit it is nice being back in Scotland, I love the variety of scenery and skyscapes we have here – I’m in a capital city with a historic castle and modern buildings like Dynamic Earth, but within reasonable distance I also have mountains or sandy beaches. Now if we could just add some warm weather – what’s not to like? Lots! I’ve been fortunate to travel as an individual, for work and as part of scuba expeditions. I’ve been to most of Europe, parts of Canada, Central & North America, some of the Caribbean, Africa and a little of Asia & the Far East. There are many places I’d love to revisit but also lots of places I haven’t seen yet so plenty more travelling to do. Australia, New Zealand and Galapagos are definitely on the bucket list. It’s hard to pick just one. It depends what I want to do. To relax nothing beats being on a dive boat, sunbathing on deck between dives, or sitting at the prow getting splashed as the boat is in transit and I can dolphin watch. One of my favourite views is just under the boat at the start or end of a dive. I have two favourite restaurants, one is a little fish restaurant on a narrow jetty over the Red Sea at the Kahramana at Marsa Alam in Egypt. The other is a tiny fondue house in the Sacre Coeur area of Paris where it’s so narrow you have to climb over the table to sit on the other side and they serve baby bottles of wine instead of glasses. What was your favourite job ever? Where was it? And can you tell us a bit about it?Well I can’t really call it work but I had a large group of divers going out to do a special trip of advanced diving on a brand new boat in Egypt. The political situation affected businesses in Egypt at the time and the new boat was not going to be finished on time. I was contacted about the delay and offered a different boat for our expedition. To assure me it was up to standard, the company invited me out for a week aboard to check her out. So a weeks diving and holiday on a newly refurbished luxury livaboard boat in the southern Egyptian Red Sea – absolute bliss. Then two weeks later I returned with my expedition and we had a brilliant time then too. Photography is something you love, isn’t it? What kind of things/people/places do you most like photographing? I started photography when I first learnt to dive over 20 years ago now. Back then the underwater camera I had was fully manual, we had a maximum of 36 shots on a film and we had to develop our own films on the back of the boat to see what shots we had at the end of the day. For me it was the best way to capture the incredible beauty that was underwater and share it with people who weren’t able to dive themselves – as well as being great memories for me. With digital cameras it is now much easier to take lots of photographs and immediately review them, but underwater it is still essential to spot the shot, anticipate marine life, capture the best lighting effect and have perfect buoyancy to not touch anything underwater. When I was teaching scuba-diving we always said, ‘take only pictures, leave only bubbles.’ If you couldn’t get a picture without touching coral or stirring up the sand – then you didn’t take the picture. Conservation is everything. I still love being underwater but I also do coastal and landscape photography as well as wildlife and local points of interest. I tend to photograph places rather than people but I have been known to be on duty for candid shots at weddings and engagements. You have taken so many fabulous shots. Do you have an all-time favourite? Tell us about it. There is a very special shot of a leopard-spot blennie that I love, these are very small fish that usually hide in nooks & crannies of the coral, you usually see just their face as they vanish into a dark hole to hide. This one I spotted while it was out sunbathing on the coral. It was the first time I’d seen this type of blennie and he was so relaxed his dorsal fin is still down. He let me take a few pictures then swam off. I love that his fabulous dotty pattern is even on his eyes and the amazing frilled effect he has on his mouth. I think I am always proudest of underwater wildlife shots as its their ocean and they can swim off and vanish at any point, that they stay and give me a chance to see and photograph them is very special. Do you plan which shots you want to get when you travel, or are you an impulsive snapper? I may have some shots in mind but I always adapt to what happens at the time. Even with ‘classic’ shots of landmarks or scenery, it really needs a dramatic sky or interesting lighting effects to make them come alive. I am always on the lookout for an interesting shot and they can happen very unexpectedly. This one was taken in torrential rain from Edinburgh’s Grassmarket as I had been driving through and stopped to capture the Edinburgh Tattoo fireworks above the Castle, no filters or photoshop required. What’s the best impromptu shot you’ve taken? Just last week, I spotted the moon emerging from behind Edinburgh Castle as I walked down Princes Street, I had to dash across the road and find a view through the trees before I missed my bus! I know you make prints of some of your photos. How else do you merchandise them? It’s mainly been by word of mouth so far, I also had a stand at Scotland’s Boat Show last year & have some postcards at Thread & Heather in Edinburgh. My paintings are one offs, but I usually do a print of them also. If it’s a private commission then totally unique, no prints. I also do food photography for my baking. Most recently I had the privilege of making my best friends’ wedding cake as my gift to them. I loved the effect of sunlight on the sugar lace, edible paint and pearls I had decorated the cake with. I can vouch for that cake, Lesley. Not only did it look amazing, it also tasted divine – both layers. Having tasted many of your cakes, I have to ask, are they available to order? When I’m not in the water I do love to cook and since moving back to Scotland I have done a lot more baking. I’ve always brought homemade things to parties and get togethers and people started asking for more. Popular requests for baking are Chocolate Guinness Cake, Carrot Cake, White Chocolate & Raspberry, Brownies, Tequila & Lime, Spiced Cranberry Cookies and Sticky Toffee Pudding. Savoury requests include Lasagne and filo pastry quiches. I also do gluten free, nut free and dairy free requests. Are there some links you could share with us to view your work and to order items we would like to buy? I post some of my work on Facebook: Siren Art & Siren Bakes, Instagram (@siren_art) and Twitter (@Siren_Art) and they are the main ways that people contact me. I have a holding page at www.siren-art.com and am working on the website for 2016. It’s best to get in touch and discuss what you are looking for and what you like. Thank you so much for visiting, Lesley. It’s been great to sit and chat with you, and thank you for the cake. Your Chocolate Guinness cake was fantastic. Well, hope you enjoyed meeting Lesley, folks. Sorry if talk of Chocolate Guinness cake has your mouth watering, but it really was rather special. Think it’s the creamy, gooey frosting …mmmm! If you live anywhere near Edinburgh, I can recommend you order one from Lesley. Do you have a favourite recipe? Tell me in the comments and, who knows, if I like the sound of it, I might invite you to join me by the fire for a chat, a cuppa…and a slice of cake. I’m delighted to be involved in promoting a new book released November 1st by S.A. Molteni. In this second instalment of the I.T. Geek to Farm Girl Freak series, follow the author as she holds on for the ride, “along the bumpy road of rural life” where her friendly neighbors become not so nice and her farm animals evolve into completely coddled pets – with her Royal Palm turkeys becoming the most pampered ones of all. The other night, when I was preparing to head bed-wards, I got a bit of a fright as I opened my bedroom door. No, it wasn’t my reflection in the full-length mirror on the opposite wall, though I will confess that has caused more than one or two startling moments in my life. No, something fluttered. And no, it was not my heart, though that happened too, but, as it settled on the dark green carpet, I caught a tantalising glimpse of invisibility. There are butterflies ~ I know because I’ve seen them in the butterfly farm, or almost seen them anyway ~ and they are transparent, translucent and iridescent. 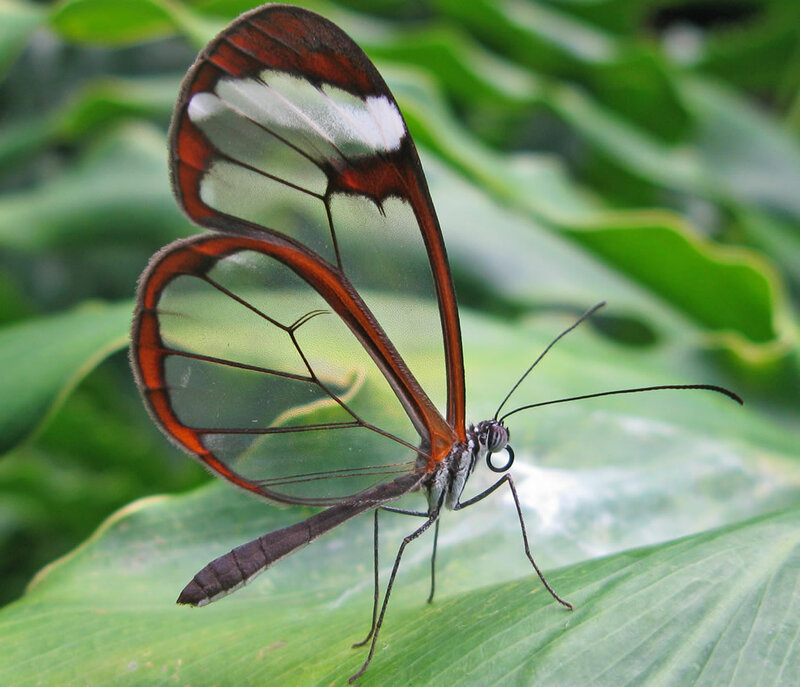 They are called Glasswing Butterflies and they are stunningly beautiful. And here was one in my house, resting on my hall carpet. Now, here is where a small confession is necessary. I’m rather nervous of things that flutter ~ funnily enough, not when they are in their own habitat so much as when they are in mine. So, although I desperately wanted to study it up close, I was afraid to get up close. I retreated back into my bedroom with all decent haste when the beautiful creature first fluttered before me, and was now faced with the problem of catching a second glimpse, never mind a study opportunity. Opening the bedroom door with all due caution, I saw that it was still there, still resting, still beautiful. What to do? Retreating once more behind the safety of my bedroom door ~ I know, I know, what was it going to do to me? Maul me? ~ I had a brainwave. Well, a brain flutter at any rate. I had a largish, clear plastic jar in my drawer. It used to contain night cream, but guessing the jar might come in useful sometime (like now) I had washed it out once empty and kept it. Taking the bottom bit ~ yes, I remembered to take the lid off ~ I once more sneaked up on the resting butterfly, and after one or two abortive attempts due to unreasoning terror, I clapped the jar over the Glasswing Butterfly. Remember, if you will, that I am afraid nervous of things that flutter in my home, so it was going to be tricky. Trouble is, I’m also half-blind somewhat short-sighted, so to be able to study this beautiful creature properly without getting down to recline beside it, I needed it raised to my work station. If I tried to slip the piece of card I held in my shaking hand under the jar and contents, the likelihood was I’d fumble it and let the butterfly loose to do what it does best ~ flutter. Call long-suffering man about the house, my hubby. Obliging as ever, hubby came upstairs and slipped the card underneath jar and contents ~ at least we thought he’d managed to do so, but on examination, he declared there was nothing in the jar. Next thing to remember: hubby is also somewhat sight impaired, at least for close work. ‘There’s nothing here,’ he said, holding the jar up to the light. So we went to the back door. ‘Sure?’ hubby asked as he prepared to set this most exotic, exciting, tantalising glimpse of invisibility free. I nodded, sad to have to miss such a rare opportunity for study, but conscious we’d already imprisoned this beautiful specimen for quite a large proportion of its natural life.